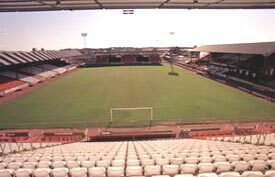 St Mirren will open the gates at Love Street for the last time against Hamilton on the 27th of December after a celebrated 115 year history at the stadium. The club sold the ground to supermarket giants Tesco (who now plan to scrap their initial plans to create a new supermarket in favour of selling the area for housing) in April last year for £18 million and will move to their new 10,000 seater stadium in nearby Greenhill Rd, Ferguslie Park. Although viewed as a good deal for the club financially, after they wiped out debts and liabilities, the loss of the stadium that has hosted some of the club’s most historic moments will be missed by fans and players and managers both past and present. Love Street, or St Mirren Park, opened in 1894 and has played host to several special occasions for Saints, including the European tie against Feyenoord in 1983, when St Mirren plaed against a team of superstars including Ruud Gullit and Johan Cruyff; the 1977 Scottish cup tie against Dundee United and Scotland’s 2-0 win over Wales in 1923. As a mark of respect for the club’s history it is believed that the housing association purchasing the area are obligated to create a Fitzpatrick Way or Fitzpatrick close, in celebration of Love Street legend, Tony Fitzpatrick, who not only managed the club twice, also made a record 351 club appearances between 1973 and 1989. The club has also released a DVD in commemoration to its history at the ground, entitled “Love Street – The Movie” – a celebration of 115 years at Love Street Stadium, Paisley, available at a retail price of £10. Posted in Sports, Uncategorized and tagged Ground Closure, St Mirren. Bookmark the permalink.